Packing up a family and going camping just got a lot easier and more comfortable. Introducing our 2018 Keystone Hideout fifth wheels for sale! With different floor plans to choose from, you are sure to find one that is perfect for your family to enjoy. With extras such as bunk houses, outdoor kitchens and great entertainment areas, everyone is sure to enjoy the next family getaway. Here are our top three family friendly features available on the Keystone Hideout fifth wheel. Happy camping! Come explore the 2018 Keystone Hideout fifth wheel. While nine people in a camper sounds like a lot, if you have a large family you need the space. And even if you don’t quite have enough to fill every bed, options are good in case you get stuck sleeping next to a snorer. (Did someone hear a bear?) 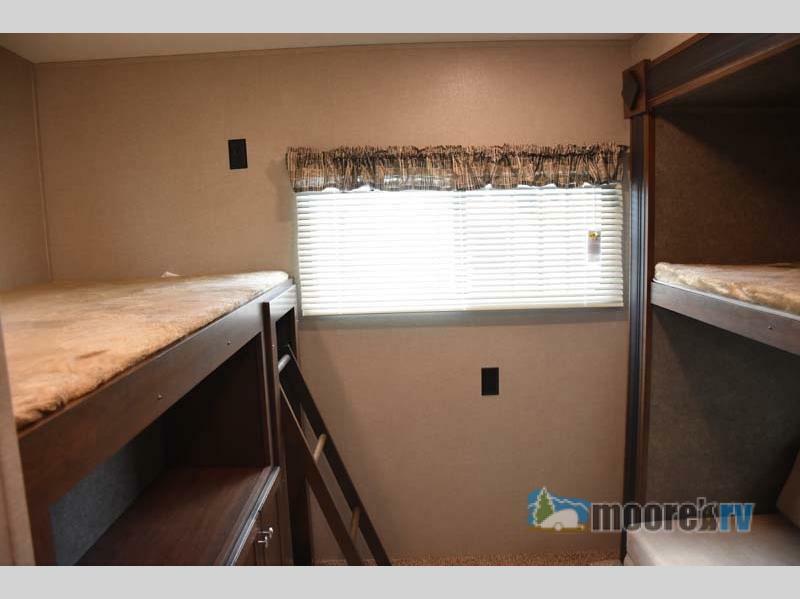 The Keystone Hideout fifth wheel does not disappoint when it comes to sleeping options. Depending on the floor plan you choose, there are options for private bunkhouses for the kids with a master for the adults. There are also options for double bunk beds if you tend to travel with more adults. The couch and dining areas convert into extra sleeping, so there is plenty of room for everyone! The kids will enjoy their own space in this bunk room! Double kitchen sink for easy cleanup. Overhead cabinets for tons of storage. There is also a convenient outdoor kitchen to use when you just don’t want to be stuck cooking inside. The outdoor kitchen is a little more basic, but still includes everything you need. 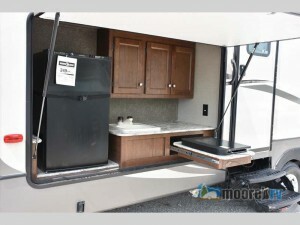 There is a refrigerator, overhead storage, a pull-out two burner cook-top and a single sink. Everything you have inside, but in the great outdoors! Cook in the great outdoors! Yes. You read that correctly. There is a full bath that includes a toilet, sink with vanity and a shower/tub combo. This bath also has an exterior door for convenience. (Especially handy when the kids are REALLY dirty!) This full bath is located in the back of the camper next to the bunk room. 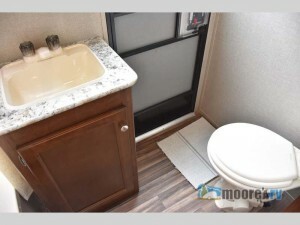 The 1/2 bath is with the master bedroom for privacy in the front of the camper. The full bath has an exterior door for particularly dirty days. Although the above mentioned are favorites when it comes to traveling with family (especially children) there are some other features on the Keystone Hideout fifth wheel worth mentioning. There are two slides in this camper to make it feel even larger and give you more space to move around. Small things such as a wardrobe/pantry combo, entertainment center and two exterior doors make camping more organized and enjoyable. 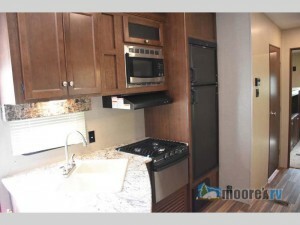 You will see these different features as you explore each of the our Keystone Hideout fifth wheel floor plans the Keystone Hideout fifth wheel has to offer. 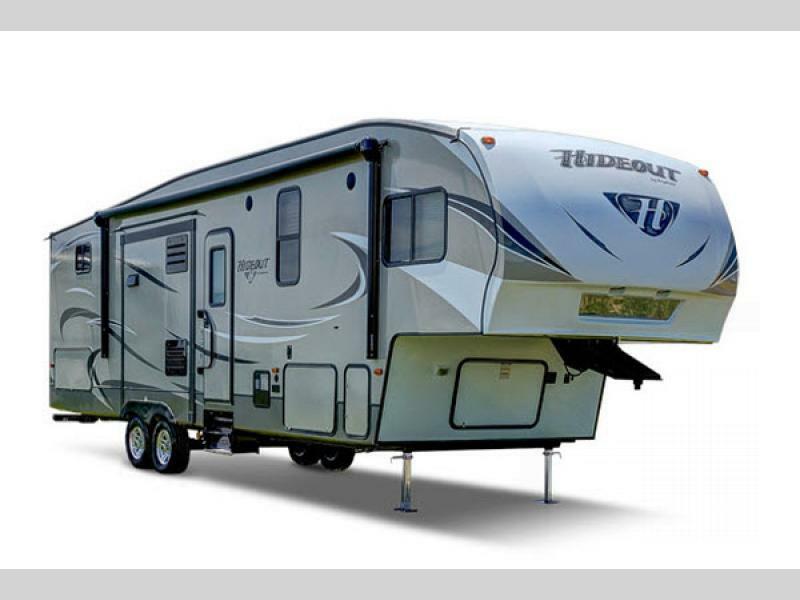 Whether your next camper is the 2018 Keystone Hideout fifth wheel or another camper, you are sure to find what you need at Moore RV. We have a friendly staff that can help you through each step of your RV buying journey. Call us today and we will get you started on the road to family fun!